As Osborne doubles nuclear research support for small modular reactors in the UK, has he ignored the new, multiple terror risks this brings in its wake? 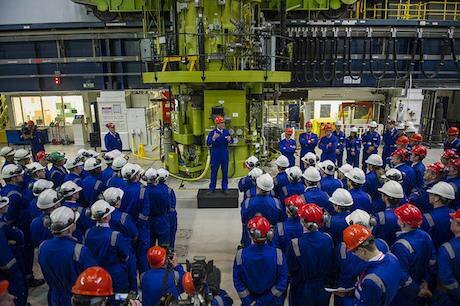 UK prime minister at Hinkley. Crown copyright/Flickr. Some rights reserved.In his Comprehensive Spending Review, chancellor George Osborne doubled research support for new, smaller nuclear reactors, as he justified slashing taxpayer support for solar and wind generation. Last month, China’s president Xi Jinping was feted in a state visit, including a banquet with Queen Elizabeth at Buckingham Palace and a meeting at 10 Downing Street with prime minister David Cameron. This came as part of finalizing a major industrial partnership deal, which involved several deals on inward nuclear investment in the UK, including a £6 billion investment (about a third of the project cost) in EDF Energy’s 3.2GW Hinkley C nuclear plant, by the Chinese state-owned China General Nuclear Power Corporation. Meanwhile, on the other side of London, over 130 nuclear company representatives, R&D specialists and innovators, along with key policy players, met in the shadow of The Tower of London for Nuclear Energy Insider’s two-day Small Modular Reactor (SMR) UK summit. Westinghouse’s roving global chief, Jeff Benjamin, vice-president for new plants and major projects, chose the summit to unveil his company’s plans to offer the UK government a partnership in the deployment of small modular reactor (SMR) technology, “a move that would advance the UK from being a buyer to a global provider of the latest nuclear energy technology”, according to a Westinghouse statement. The proposal is intended to complement the current Phase 2 SMR study that the UK government has recently commenced. As proposed, the partnership would be structured as a UK-based enterprise jointly owned by Westinghouse, the UK government and UK industry, in which Benjamin revealed to the summit it would be expected the British government would take an equity stake, which could be reduced as the risk profile reduces. In his presentation, Benjamin, who asserted he was not a big corporate profit-driver, said that for Westinghouse, “nuclear was not a be-all end-all technology”. He conceded that, despite Westinghouse planning to base its SMR operations at its UK base in Springfields nuclear fuel plant near Manchester, some of the Westinghouse SMR equipment may be covered by restrictive US export controls. It quoted the World Nuclear Association's most optimistic estimate that there could be as many as 96 SMRs up and running by 2030, suggesting some 20 designs at various stages of development were already underway. The SMR-UK summit is in many ways the next corporate stepping stone in the SMR evaluation process. It recommended a more in-depth analysis to establish the robust evidence base needed to enable a policy decision on SMRs and help the government decide whether it wants to pursue a UK-SMR programme. This second phase of work is now under way. The summit heard from three key British contributors to this work: Mike Middleton, strategy manager for nuclear at the public-private Energy Technologies Institute, which published its own interesting scoping study on the “role for nuclear within a low carbon energy system” in early October, Dame Sue Ian, a chair of the UK Nuclear Innovation and Research Advisory Board (NIRAB) and Dr Gordon Waddington, who drafted the 64-page UK feasibility study on SMRs. Waddington claimed that, as “it was always going to be difficult for the UK” to be directly involved in the large (GW) reactors development – with several major global players – SMRs are “an option for the UK to enter the reactor market.” But, he stressed, the economic climate has to be right. Dame Sue Ian, who chaired a closed UK-only workshop convened by the UK Department of Energy and Climate Change (DECC) – which led to the 2014 UKNNL SMR feasibility study – made a strong appeal for government investment in new nuclear research including SMR R&D, especially when the DECC internal techno-economic assessment (TEA) study is complete. Warning that the UK regulator needs serious technology to assess – “stuff not fluff” as she dubbed it – she said that the UK Nuclear Innovation and Research Advisory Board has made a bid for substantial resource support from the UK Treasury in the Comprehensive Spending Review, published late in November. The Energy Technologies Institute is arguing that the UK could accommodate up to 75GW of new nuclear in the UK to help decarbonize the UK power generation sector. Using a model developed by ETI (Energy System Modelling Environment, ESME), Middleton said SMRs could provide some 63 GW of this new capacity, especially if they were developed in conjunction with a planned national heat grid program for domestic district heating and industrial process heat, to enhance the SMRs’ economic competitiveness. Professor Andrew Sherry, chief science and technology officer for UK NNL, in a presentation on public perceptions of new nuclear, flagged up several key new siting and public perception issues with which promoters of SMRs will have to engage. These include: SMRs will have new designs and concepts; prototypes will provide essential learning tools; the costs are at present unknown, but they will come down with modular production; they could have a dual power and heat production purpose; their siting will demand different engagement with communities than GW-size plants, as many SMRs will inevitably be built much closer to centres of concentrated populations. Meanwhile, the UK Nuclear Industry Council – on which Professor Sherry sits – is on the verge of publishing a new report, “Nuclear Energy and Society”. Professor Sherry gave a sneak preview of “this concordat on public engagement” to the summit, which, as he emphasized, recognizes the need to take the public concerns about the nuclear industry seriously. Dialogue (we value two-way communication and will listen to the public voice), trust (we seek to build public trust by showing respect and being open and transparent about the challenges we face and the actions we are taking to address them), clarity (we ensure that public engagement is characterised by clear, consistent and concise information written or spoken in plain language) and consultation (we listen to communities and actively consult with them, particularly when our activities impact on daily life). Several would-be suppliers of SMRs presented status reports on designs and development of their own SMR prototypes. NuScale’s executive vice-president for programme development, Tom Mundy, argued that SMRs are part of the energy mix, and should not be regarded as alternatives to big GW reactors. NuScale has, to date, gained the backing of $217 million from the US Department of Energy for reactor development, based on an early conceptual design by one of NuScale’s founders when he worked at Oregon State University a decade ago. Each NuScale Power ModuleTM is a self-contained module that operates independently of the other modules in a multi-module configuration. All modules are managed from a single control room. The reactor measures 65 feet tall by 9 feet in diameter, and sits within a containment vessel. Design certification Is expected by the end of 2016. Mundy pointed out that the NNL-SMR feasibility study last December described the NuScale Module concept as “credible” and deployable within 10 years. Perhaps the most novel reactor type discussed at the summit was the micro-SMR from British company U-Batteries with an output of only 4MWe. The company hopes to have the demonstration U-Battery operating by 2023 at the URENCO site at Capenhurst, close to Manchester. A market scoping study by Collinson Grant released in April 2014 suggested that there could be a world market for this micro-SMR of 280 by 2035, including 41 in the UK. But U-Battery presenter, Dr Paul Harding, was the only SMR promoter to mention security and proliferation concerns with the prospective deployment of thousands of new reactors worldwide. He stressed the importance of securing UK IP for SMRs concepts. Other concepts were presented by the UK’s Rolls Royce, Bruce Power and China National Nuclear Corporation (CNNC)’s New Energy Company. The latter would be competing with its big brother GW Plants, as CNNC looks for global market expansion. Its ACP-100 design, which has been under development since the Fukushima accident in Japan in March 2011, would be multifunctional for co-generation. In China, it would require a much shrunk emergency planning zone as ACP-100s would be built close to urban areas. Senior CNNC engineer, Dr Song Danrong, said CNNC wants to co-operate with the UK nuclear sector to promote innovation and overcome technical challenges. Perhaps the most provocative presentation came from Dr Kristiina Soderholm, the head of research development for Finnish power generator, Fortum. She presented on radical regulation revision, arguing for international standards for generic licensing for core sections of SMRs, and to make national regulation more streamlined. One omission from every single presentation at the summit was consideration of the long term management of radioactive waste arising from such a huge projected increase in nuclear capacity, especially as it is recognized that the greatest public concern over nuclear surrounds radioactive waste. And with the UK Energy Technology Institute proposing the proliferation of dozens of new SMRs across Britain, the terrorist risk has been ignored. Any future summit will surely need to address this.